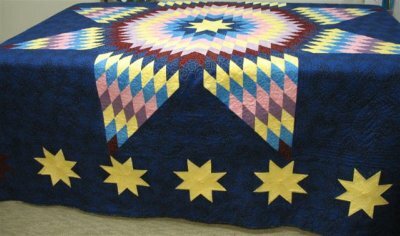 The Lone star quilt pattern has 8 equal triangles and when sewn together actually radiates from the center of the quilting motif. I encourage you to draw the Lone Star Quilt Pattern yourself. Doing so you will find that you better understand how the small parts fits together. This helps when it comes time to sew the pieces in the proper order. Everything about this star is based on equal parts which is why it can easily be made any size to fit your needs. It is an example of set-in seams and when broken down is fairly easy to piece together. 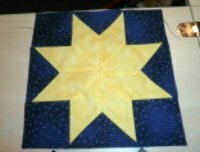 This Quilt Idea is sometimes called the Radiant Star, Star of Bethlehem, or Texas Star or just plain perfect star. This is an excellent motif on which to try different Continuous Line Quilting patterns and Machine Quilting Patterns. Drafting a pattern does not have to be intimidating. Before the countless number of patterns, books and software programs that are available today, it was not unusual for a quilter to draft their own patchwork quilt patterns for a quilt. I agree, you should not have to do any more then necessary, but in the early part of this century if you wanted to design your own Lone Star Quilt Pattern you would have to draft the block yourself. Or maybe you could find someone who would do it for you, that is until now! This web page does it for you; an absolutely free quilt block! Score points and share this site with all your friends! When you draw the Lone Star Quilt Pattern yourself you will better understand how it fits together which helps when it comes time to sew the pieces in the proper order. All right, so you never want to have to draw your own design. But I can tell you that sometime it will be necessary to redraw a block in order to get the right size to fit your quilt. There are very few free quilt blocks as easy as the lone star quilt pattern and it is an absolutely stunning quilting motif. This Lone Star Quilt Pattern is not based on equal grid squares but rather on equal triangles. With our quilt instructions we start by drawing a square any size. If you have a paper cutter, cutting a perfect square is easy. Find the center of your new square by drawing two diagonal lines from corner to corner which will find the exact center for you. Then draw two more lines vertically and horizontally to divide the square into eight triangles. If the paper is thin you can also fold the paper and then draw on the folds to make the lines visible. If you have a compass you can use it. But, our quilt instructions will assume that you do not. 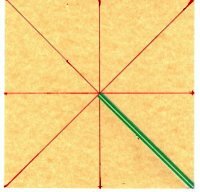 Cut a strip of paper the distance between any corner of the square and the center of the square as shown. You can also use a piece of dental floss or string to get an exact measurement for this step. 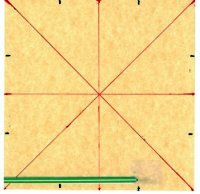 Next, hold the strip of paper or dental floss on any one of the four corners and moving in a clockwise direction make a hash mark at the end of the strip on the outer edge of the square. Then repeat by moving in a counter clockwise direction and place another hash mark in the other quadrants for a total of eight hash marks. These hash marks will be the points of the star. These tips will give insight to understanding the basic of drafting. Always use the most accurate graph paper you can find. Look for the kind that engineers use. Usually you will have good luck by going to a store that handles art or drafting supplies. Some papers will be accurate in one direction but not the other direction, so check dimensions with your ruler since you will most likely pay per sheet. I find it relaxing to doodle on drafting paper and I always have a supply on hand just in case! As I mentioned earlier, for the Lone Star Quilt block you won't need drafting paper...just a piece of plain paper and dental floss or string! 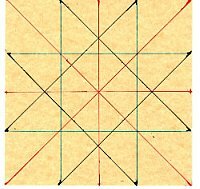 So, moving forward, connect the eight hash marks by drawing four more lines joining the eight points you just made on the outer edge of the square. Now, draw four more lines joining the points diagonally across the square. If it is not easy for you to identify the design either color them in or shade them so they do become easy to see. This is kind of like a trick question...if you stare at it long enough you will see the answer (design) you are looking for! A fine-tipped mechanical drawing pencil is ideal for drafting but a no.2 lead pencil and a good sharpener will do too. 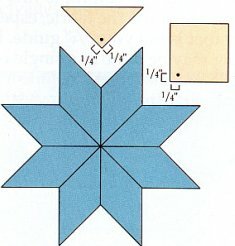 Just make sure the pencil is sharp, as fat pencil lines will make your Lone Star Quilt Pattern inaccurate. Get yourself a good drawing ruler. It will come in handy when you make this template as well as any others. A drawing ruler is thin and generally has a red grid of 1/8-inch squares. Because it is thin it will not cast a shadow on the paper and make it difficult to see where the pencil line is suppose to be. Clear plastic grid rulers are not always printed accurately so it is best to get a drafting ruler; the kind that an engineer would use. With your paper cutting scissors you can cut your Lone Star Quilt Pattern apart. Add the 1/4-inch seam allowance around each shape to make them the correct size for cutting your pattern pieces out. The steps to sew the Lone Star Quilt Pattern pieces together will work regardless of the size. When sewing 2 Lone Star diamond pieces together, place diamonds right sides together, carefully matching edges and pin. Make a small dot 1/4-inch from corner of one piece. Stitch pieces together in the direction shown, starting exactly at the star's edge and stopping at the center of the dot on the opposite edge, leaving the seam allowance free. Secure the seam by backstitching or set your machine to a small stitch (number 2 setting) before you do any sewing. Repeat this procedure for two more lone star diamond pieces and then join the two sections together. The precise starting and stopping points in these quilt instructions are important. You will see in a minute when you join the diamonds together. Repeat this procedure for the second half of the star and then join the two halves together to make a full star. Did I mention how important the starting and stopping points were going to be in the quilt instructions? You didn't miss that, did you? For best results, add side triangles, then corner squares to the diamond sections. Mark corner of each piece to be set in with a small dot. To sew first seam, match right sides and pin the triangle or square to the diamond on the left. Stitch seam from the outer edge to the dot, backstitching at the dot; clip threads. To sew the second seam, pivot the added triangle or square to match raw edges of next diamond. The raw edges should match perfectly. Beginning at dot, take 2 or 3 stitches, then backstitch, making sure not to backstitch into previous seam allowance. Continue stitching to outer edge. When sewing with diamond or triangle pieces, the tip of the seam allowances may extend beyond the edges of the sewn pieces. That is ok...just trim away all the tips that extend beyond the edges of the sewn pieces. 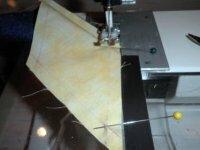 Press as you sew using an up and down motion, taking care to prevent small folds along seam lines. Seam allowances are almost always pressed toward the darker fabric. Occasionally it may be necessary to press seam allowances toward the lighter fabric or even to press the seam open. Try to prevent a dark seam allowance from showing through a light fabric. 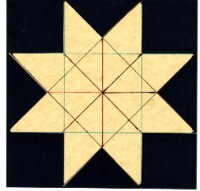 There you have it; one beautiful star to use in your border when making the Lone Star Quilt, also called Radiant Star, Star of Bethlehem, or Texas Star. See how well you know your States!